Applications are now being accepted for the Disney College Program – a partnership with the university that offers internship opportunities for all Missouri Southern Students. Missouri Southern has developed a formal partnership with the Disney College Program to strengthen internship opportunities for all MSSU students. Dr. Richard Miller, director of the James R. Spradling Center, is spearheading this initiative to provide our students with an unforgettable internship experience with the Walt Disney Company. 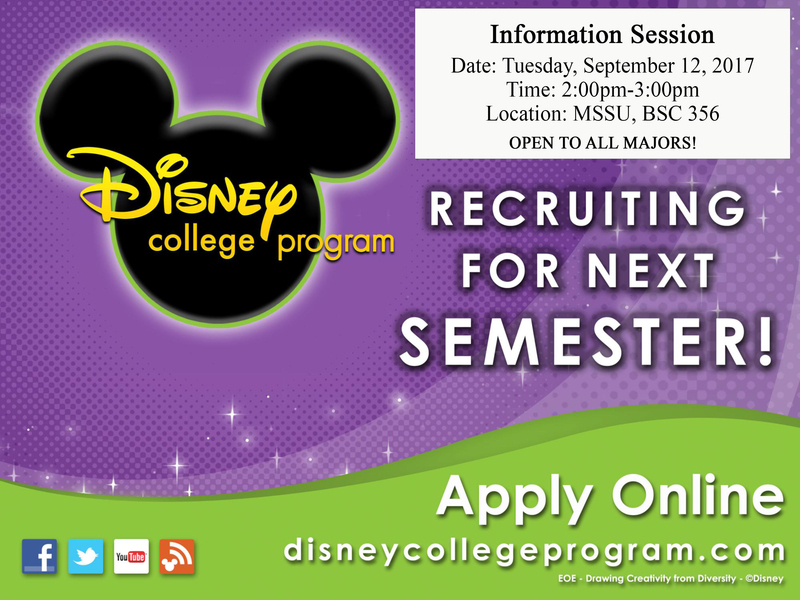 An information session will be held at 2 p.m. Tuesday, Sept. 12, in Room 356 of Billingsly Student Center. Students who are looking for internship opportunities are encouraged to attend and learn about program eligibility, academic credit and financial aid options. For students who are unable to attend, they may contact Miller in Room 306 of Hearnes Hall, or by calling ext. 9385.